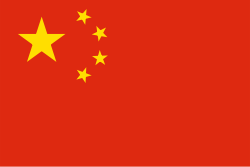 China’s flag features a simple design of a red background with five golden stars. The background represents Communism, the government structure that is followed in China. One of the stars of the flag is larger than the other. This represents the leadership of the Communist Party, with the large star representing the government and the smaller stars representing the unity of the people of China. The main color of the Chinese flag is red, with a red background dominating most of the flag. In the upper left quadrant, or “canton,” there are five golden stars used to represent the leadership of China and the people. The larger star is located to the left of the four smaller stars, which are arranged in a pattern circling the right side of the larger star. The earliest Chinese flag was used in 1644 during the Qing dynasty. This flag was known as the “Yellow Dragon Flag” and was used until the monarchy was overthrown. In 1895, Lu Haodung designed a flag for the country. His flag was later used for the KMT party. This flag featured a blue background with a large white sun positioned directly in the center. In 1906, the flag was designed by Sun Yat-sen to incorporate the red that is used today. In the early 20th century, different flags were used throughout the country during the Wuchang Uprising. The blue and white flag was used in some provinces, while a flag boasting 18 stars was used in Wuhan. In the norther region, a flag of five colors—red, blue, white, yellow and black—was flown. Upon the establishment of the Republic of China, the “Five-Colored Flag” was chosen as the national flag. The “18-Star Flag” during this time was used by the army, and the modern red and yellow flag was used as a naval ensign. The red and yellow flag was officially adopted as the national flag in 1928. The years ahead saw multiple designs, many of which were rejected. In 1949, a design known as the “Five-star Red Flag” was adopted. This is the design that is still in use today. In 1990, a set of rules were created by the Seventh National People’s Congress setting out guidelines for how the flag should look, how it should be flown and where it can be flown. There are also specific guidelines for how the flag should be folded. Laws in China outline the official sizes of flags, including five official sizes for flagpoles and four smaller sizes for other uses, such as displaying in an office or a vehicle. In addition to its national flag, China also has other flags for its military, various organizations, and special administrative regions.